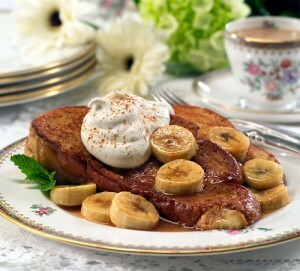 Our dine-about-the-world correspondent Kristi Casey Sanders passed along a recipe for Brioche French Toast with Bananas Foster that will start Mom's special day with a Wow! 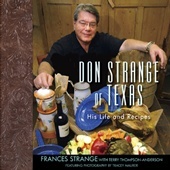 This can't miss dish combines the best of breakfast and dessert and comes from the cookbook, Don Strange of Texas: His Life and Recipes by Frances Strange, the late foodster's widow. To make the French toast, combine the milk, eggs, cream, cinnamon and nutmeg in a medium bowl; whisk until eggs are well beaten and the batter is smooth. Melt some butter on a flat griddle over medium heat. Dip the brioche slices in the egg batter, coating both sides, allowing excess batter to drip off. Place battered bread on griddle. Don't let the slices touch one another so cook in batches if necessary. Cook until golden brown, turning once, about 2 minutes per side. Keep hot in a warm oven until ready to assemble and serve. In a small bowl combine brown sugar and cinnamon with a fork and set aside. µelt butter in a 12-inch skillet over medium heat. Add cinnamon and sugar mixture and stir until sugar dissolves. Add banana liqueur and 1/4 cup of the rum. Cook, stirring, until syrupy and thickened, about 5 minutes. Add banana slices and lightly coat with the syrup. Add the rum and, swirl the pan and tip it toward the flame to unite or, if using an electric range, light the rum with a long match. Swirl the pan, basting bananas with the sauce, until flame subsides. Remove pan from heat, set aside and keep warm. To serve, stack slices of French toast on each serving plate. Place banana slices on each serving and drizzle some of the pan sauce over the top. Add a generous dollop of the whipped cream, sprinkle with cinnamon or nutmeg and add a mint sprig.